Every Year, the School of Visual Arts Honors one distinguished figure in the field of design, as part of its Masters series. After honoring Jules Feiffer in 2006, and Heinz Edelmann in 2005- this year’s honored master is Steven Heller, the writer, critic, Art director, educator and leading figure in today’s graphic design scene. “The Masters Series: Steven Heller” exhibition opened in New York at the Visual Arts Museum and will run until December 8. I won’t go over the accomplishments of Heller in his multidisciplinary involvement in design- Being the author of more than 100 book on graphic design is more than a sufficient proof of this deserved merit. But maybe as a former student of Steven Heller at the MFA Design program of the School of Visual Arts, I can certainly talk about the impact he leaves on the graduates of the program that he conceived. His enthusiasm for the “Design as entrepreneur” concept have changed the way each of us -his students- look at our career, and how to become the authors of our own ideas, and hence our own clients whenever that is possible. Heller has also became a mentor, particularly with an impressive, efficient, and very puzzling way of working. I have probably never seen anyone as efficient as he is, starting his day almost at 4.30 AM and finishing on the spot each tasks that comes his way, despite the fact that he has more than one full time job going on at the same time. 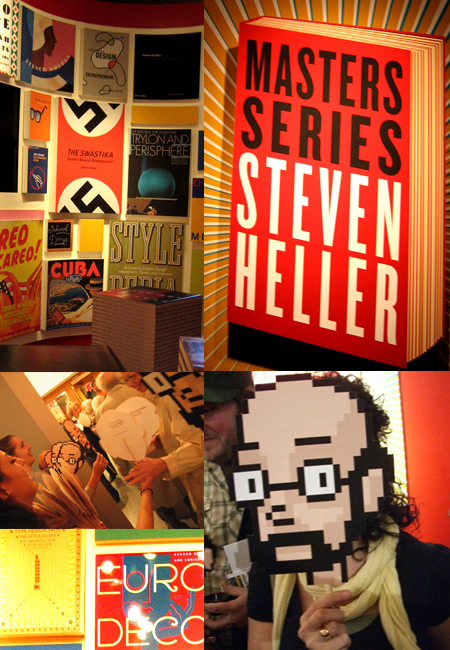 I have unfortunately not been able to visit the exhibition personally, but being part of the “Steven Heller” culture at SVA, the news, photos, and details of the show that arrived to me made me feel that I have been able to be part of this celebrated show for all the alumni, friends and supporters of the MFA Design Program. Posted here are some photos taken from the opening of the event.